Well The Photo is Fine. And Man that's Such a Cool Idea ! Yep Keep Posting these Really Like em . How many are you shooting for your grave yard. Cool idea. Look at some of the things other people have come up with in order to use the patterns in a cool way. (Eggs, ornaments,) You could have a whole graveyard in your yard for halloween!! 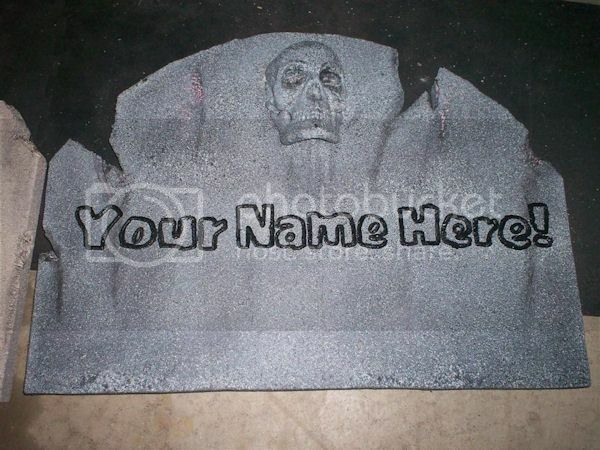 I think we've got about 15 tombstones made currently. I have no set plans beyond these 15. 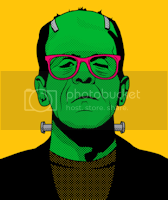 Serial killers first then classic movie monsters. I'm working on Michael Myers right now. Then I'm going to sand down the ones that aren't decorated and repaint them to get a smoother surface. I'll take pictures of some of the "pumpkins" I've got made when we put them out. How do you get all three shades painted? Don't tell me you cut out EVERY opening in the patterns!! IF so, what a lot of work. Transfering the pattern is the hardest part. I have to trace the entire pattern onto the tombstone using carbon paper (regular carbon paper for typing). This is the reason I'm going to sand down all of my remaining tombstones. Then I decide if I'm going to paint them as they are or reverse the colors. Getting all the fine details is somewhat maddening to trace and paint, so I know a little bit out what you guys are going through with the carving. Is changing the shape of some of the Stones / Wood. You can also Add some Foam or ceramic Decorations and paint them the same color of the stone. Just stuff from a Dollar Store. Angels, Crosses, Skulls. Also how are you blowing up the patterns - I maybe able to help with that. The ones I have currently all have to same shape because all we currently have are a regular circular saw and an electric mitre saw so we're kind of limited. We're hoping to get a jigsaw later in the year. The program I use to edit and print is called Photofiltre. I take out all the unnecessary printing and then crop the photo. When I print I have the option to blow the picture up to the size of the paper. This is about as large as I can get and still have room for the name and sayings. I choose lines from the movies as you may can tell. Very cool and creative idea. My mini graveyard for halloween is in deperate need of these ideas. Keep them commin' grinner. What a great way to use the patterns. Please post pics of your graveyard when you get it done. Can hardly wait to see it!!! !